Paradox Interactive has announced Conquest of Paradise, the first expasion for its empire building game Europa Universalis IV. Paradox Interactive, a publisher of games that never settles down, today revealed details on the first expansion to Europa Universalis IV, the award-winning empire building game developed by Paradox Development Studio for Windows, Mac, and Linux. Are you ready to explore a brave new world? The new expansion, Europa Universalis IV: Conquest of Paradise, allows you to send your ships off to the west to discover a new world, unlike any you’ve seen before. For the first time ever in a Paradox Development Studio game, players are given the chance to discover a completely randomized American continent, where no playthrough will ever be the same. 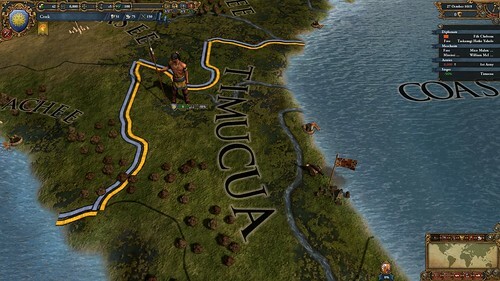 Europa Universalis IV: Conquest of Paradise makes it possible for you to play as a Native American nation and master the federation mechanics, as well as unique national ideas, buildings and events. You may also take command of a Colonial Nation, declare colonial war, or even strive for liberty from your motherland.